Mike Caruso, Orland Park Consolidated High School District 230, USA "ApplianSys' sales and support staff are perfect. They're like my friends now. 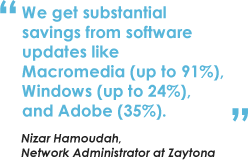 I can simply ask for help from any one of them"
Naif Orabi, Network Administrator at TAIF Ministry Of Education, Saudi Arabia "We wanted an appliance that was easy to learn and use and that’s what we got with DNSBOX"
Located in West Bank, Ramallah, Zaytona is the second ISP to be established in Palestine. It has 6 branches in major cities across the country, with over 100 wifi hotspots. The ISP provides internet services for approximately 15,000 commercial and residential customers and also offers dedicated internet services and web hosting. Having looked at multiple solutions online, Nizar came to the conclusion that CACHEBOX would be the best way forward. To put CACHEBOX to the test, the ISP decided to deploy one unit to serve 200 wifi users who were not catered to by its existing solution. A lot of traffic from this particular user group came from video files so it was a good representation of other groups and traffic profiles which the ISP catered to. Secondly, the support we received from our previous vendor was extremely displeasing. In contrast, ApplianSys is a company that cares about its customers. We received tremendous support from the team even after I bought CACHEBOX – the team called me and checked how my unit was performing! This is rare in my experience. I decided then that for any future caching solutions, I would only consider CACHEBOX. “We were very impressed with CACHEBOX’s ease of use and its value for money,” comments Nizar.